I've said it on this blog before and I'll say it again: if you love glitter polish, you need some Loaded Lacquer in your life! They truly are the best glitters... ever! Today I have another gorgeous glitterbomb to show you. Loaded Lacquer Giddy Up is a clear base packed with multi-sized holographic silver hex, berry pink hex, bright pink hex, lilac hex, holographic magenta hex, and an incredibly unique blue/gray hex! Wow... that's a lot of glitter and it makes for one stunning combination! The formula is, like all Loaded lacquer glitters I've tried, perfect. The glitters come out easily, no fishing required, even the large glitters are very well behaved. All you need is 1 coat over an opaque base for a stunning result, or you can add a second or third coat to get it completely opaque all on its own. That's how packed with glitter this polish is. 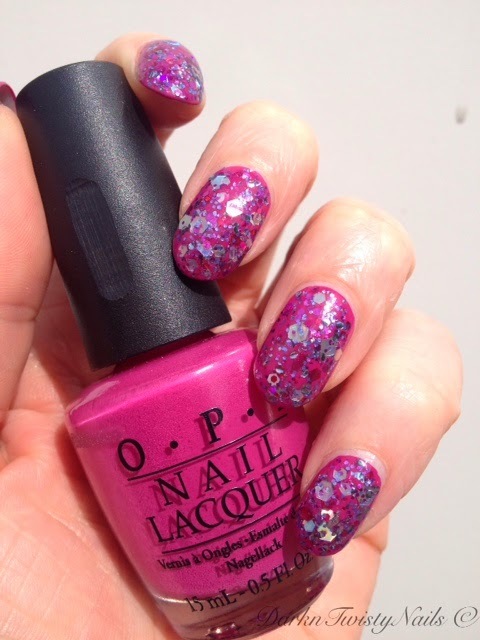 I layered Giddy Up over OPI Dim Sum Plum for this mani and I really love the combination. 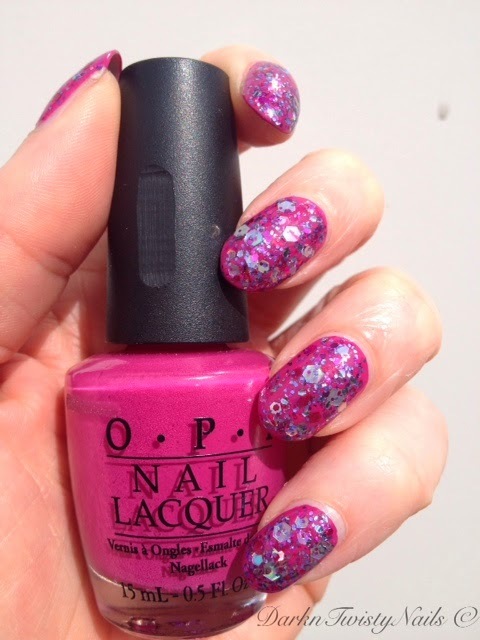 The deep plum base makes the glitter pop on my nails and when the sun hits the holo glitter... I have no words to describe how gorgeous this polish is. An absolute must have in my book! Loaded Lacquer is available on this website. Heather (creator of Loaded Lacquer) just posted on Facebook and Instagram that she will be coming out with a new collection very soon, the Sushi Bar Collection. Oh boy... Heather, what are you doing to me? Not only are your polishes awesome and hard to resist, now you combine my two favorite things in 1 collection: sushi and glitter! I need them all! Have you tried Loaded Lacquer and if not, what's stopping you? I so agree Anca, it is the best Indie Polish I have even seen!! !